COMPANIONS PLUS SENIOR CARE offers quality, non-medical home care to those who need minimum assistance in order to maintain their independence. COMPANIONS PLUS SENIOR CARE takes the worry out of your daily life by providing trained, patient, and highly qualified in-home companions day or night. We offer affordable, convenient, dependable and personal service to those who want to continue to be independent and live within their own homes. "Companions Plus Senior Care was formed to give senior citizens a dignified choice to remain independent within the comfort of their own homes with companions who care." 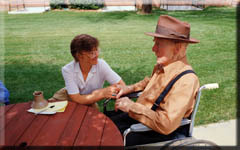 President and Owner, COMPANIONS PLUS SENIOR CARE, INC.
enable seniors to stay at home.